Fish Co. is the duo of fellow Englishmen Steve Rowles and Steve Fairnie. Fairnie (and sometimes Rowles) would go on to create progressively more bizarre and strange music under various names, including Writz, Famous Names, The Techno Twins, The Techno Orchestra and The Technos. As Fish Co. they produced some excellent insightful and intelligent British rock, folk, pop and ballads. 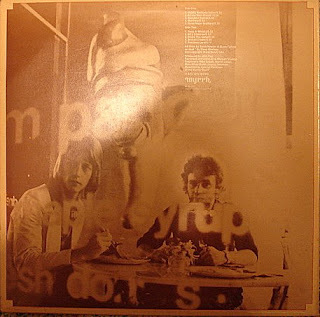 Several songs on Can’t Be Bad are based on slice-of-life characters – titles like ‘Jimmy Bootlace Seller’, ‘Matthew’, ‘Soup And Whisky’ and ‘Broken Dream’. Nice folky acoustic feel to a lot of the tracks, offset with a few decidedly rock-edged cuts like ‘60s Children’ and ‘Beautiful Secret’, the latter with a biting electric guitar lead. The Steves supply the acoustic guitars, vocals and song-writing, assisted by others on piano, lead guitar, saxophone, bass and drums. (The Archivist, 4th edition by Ken Scott). Just found your site while Googling for Kendrick MP3s. You have so much that I miss – I had to sell a large collection of Christian vinyl when we moved house last time. Some of what you say (this included) is what I sorrowfully parted with. Absolutely thrilled to discover you (in case you hadn’t gathered). This is a great album. I'm loving it. Did you have any luck with the cover photo? I have been looking everywhere to listen to Can't Be Bad. Your download link is broken. Any help? Going to take a few days for me to get to it but will redo the link. Sadly, link appears to still be broken.